Most studies on training imagery skills (either through a particular set of training exercises or indirectly through geometry, chemistry or physics courses) have produced at best small gains in spatial skills and limited transfer of training to a different stimulus set. We suggest that the reason for previous limitations of training visual-spatial abilities using conventional 2D tasks that is that encoding of spatial relations and cognitive strategies applied to perform visual-spatial transformations in 2D non-immersive and 3D immersive environments are different. Thus, in our research we particularly interested in investigating training in immersive 3D virtual environments , and the effects of individual differences in visual imagery ability on training efficacy. are critically important for effectively assessing and training large-scale spatial rotation and orientation abilities or any other tasks that might rely on the egocentric spatial system. 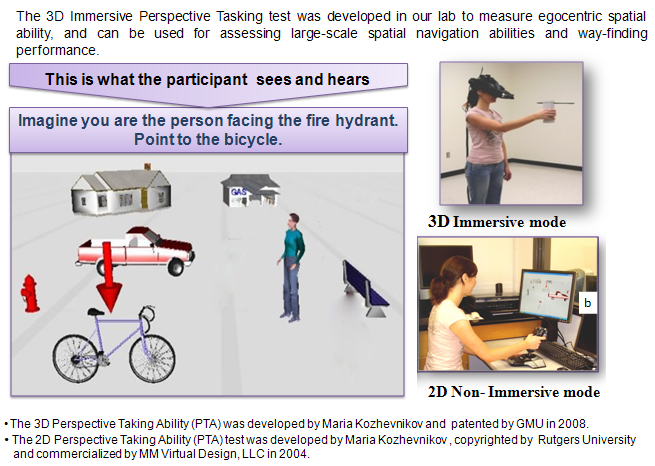 The perceptual immersivity of an environment seems to be the most important factor in providing information for building an egocentric spatial reference frame needed in performance for real-world, large-scale spatial tasks and higher-order motor planning. 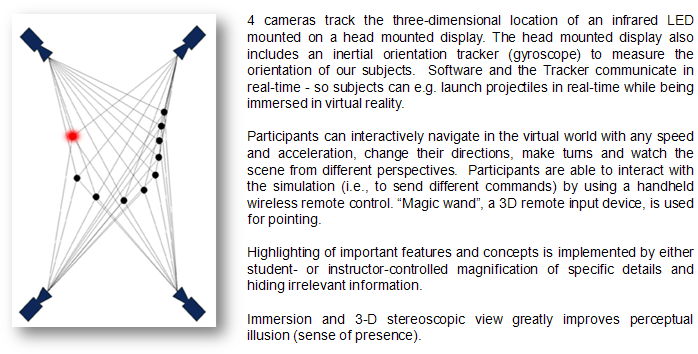 Immersive virtual environments are particularly relevant for training real-world egocentric spatial tasks, such as navigation, teleoperation, or medical surgery, which require visual-spatial processing, due to two major factors: immersion and feedback (Kozhevnikov & Garcia, in press). facilitated a 200% increase in performance (i.e., the rate of error reduction), compared to the non-immersive 2D version of the test.